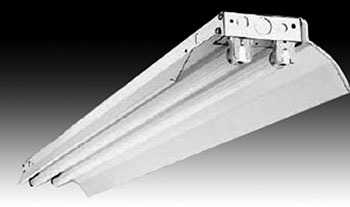 Specification grade standard LED or fluorescent industrial fixture with white symmetric reflector. For use in indoor applications where an LED or fluorescent industrial fixture with tool-less design and low cost is required. Fixtures can be mounted as individual fixtures or with end removed fixtures slide together for mounting in continuous rows. Available in 3′, 4′, 6′ and 8′ lengths.